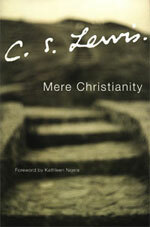 Mere Christianity is a Christian apology; in other words, it seeks to explain the belief structure of Christianity in a way palatable to both believers and nonbelievers. Thus, it focuses on only those elements of Christianity that have been part of the belief structure in almost all times and all places and avoids the differences between denominations and also issues with Christian history. It uses a logical structure and follow-through that makes it a wonderful book for both Christians and non-Christians alike to really understand the theological underpinings of Christianity without the strong opposition of an atheistic perspective or the blatant fervor of an evangelical. 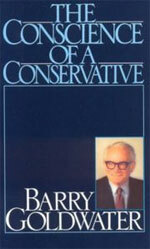 The Conscience of a Conservative basically spells out the political beliefs of Barry Goldwater, a Republican Senator from Arizona who ran for President in 1964. He brought to the table a very clear political perspective, one that is basically completely alien to the “conservatives” today. In a nutshell, this philosophy has only one true litmus test: local governments are better suited to solve local issues, because every person and every community are different. The federal government should solve issues of interstate commerce and national defense and that is all. This enables each state to decide their own path on most controversial issues, enabling like-minded people to live in states that respected their beliefs without federal interference. 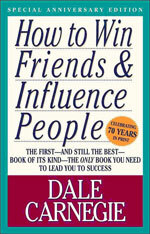 How To Win Friends And Influence People is about how to deal with social situations, nothing more, nothing less. It’s very well written and broken down into small pieces that anyone can follow and accomplish. So why did it impact my life so strongly? To put it simply, I was not exactly adept at social situations before reading this book. I had a very hard time … well, winning friends or influencing people. As I came into leadership roles, all I had to rely on was pure demonstration of my own abilities to lead, and while that can be a tool for inspiration, it can only carry so much weight – and it certainly doesn’t help when you’re standing up in front of a crowd of people who don’t know you or your record and you have to convince them that what you’re doing is valuable. This book, because it broke down the ability to work through social situations into tiny things that I could practice and learn, made it possible for a complete social train wreck like myself to begin to be able to speak in public venues and relate to other people – which completely changed the rules of how my life worked and what I could do with it. 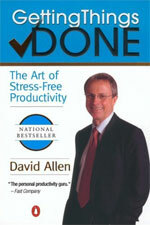 Getting Things Done is a book on personal productivity for those who really don’t want to (or have the time to) commit themselves to a sticy, compex system of task management. It has one overall guiding principle: write down the stuff you need to do as you think of it, then process that list when you have open time. If you have ongoing projects, keep a list or a folder for that project and check on it regularly to keep it going. That’s the nutshell of it – the book goes on to show examples of how it works and add some detail for specific situations, but that’s really the key. You are currently browsing the archives for the I want this category.